We go behind-the-scenes of Glasgow’s oldest Indian restaurant, the Koh-I-Noor, to explore the dedication and vision of the Tahir family. We also include a recipe – no, not for the full bhoona – but for delicious Chicken Tikka which originates from the Punjab region. When they put a dish on the menu called the ‘Full Bhoona’—a large lamb bhoona served with a sizeable side salad—it’s unlikely they knew then how famous that saying would become. Now the oldest curry house in Glasgow, the Koh-I-Noor is over fifty years old. It has been a labour of love for the Tahir family, bringing traditional Indian and Punjabi cuisine to the hearts—and stomachs—of Glasgow, Scotland, and beyond. The much-loved restaurant situated on North Street today is very different from where it all began. The humble beginnings of this renowned curry house stretch back to 1956, when current owner Waseem Tahir’s grandfather, Qadir Baqash, came to Glasgow from Pakistan. 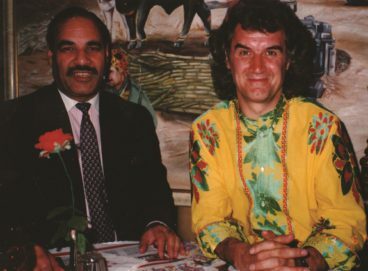 In 1960, Qadir was joined by his son Ghalum Rasul Tahir and in 1964 they opened the Koh-I-Noor restaurant in Gibson Street with only six tables. Since then, the family has endured several trials and successes to build the curry house Glaswegians know and love today. Over the past five decades it has become a favourite with locals, restaurant critics and celebrities alike. 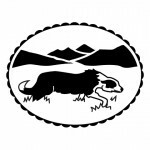 ‘As I approached by 18th birthday my best friend and I were invited for a few beers in the Beer Bar at Glasgow University Students Union and an Indian curry by my friend’s elder brother and his friend, both second year students. At this time, students existed on student grants—not loans. But, like students today, the grants never lasted long. Consequently, the enterprising pair that my newfound friends were would invite curry “virgins” for beer then a kofta vindaloo on the premise that the newbies would be unable to handle such a hot dish and relinquish it to the ever-hungry older pair. This was the first time that I would enter the Koh-I-Noor but certainly not the last. I am proud to say that my friend and I survived the ordeal of this, the hottest curry available at the time, and indeed it became a favourite. Both father [Rasul] and son [Waseem] have always been generous in giving advice on making curries but never revealing the marinade for their lamb. There were a few times also when they gave me and other friends milk and sugar to take home, before the shops seemed to be open all the time. But what else keeps them going? Why are they such a good restaurant? The food, obviously, but what about location? In Gibson Street when we were students, excellent, but we have left uni and live elsewhere; the service, the staff in general, ambience? The price? A meal no longer costs what it did when we were students, but then, we get paid more. 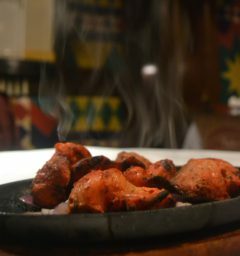 Originating in the Punjab region, chicken tikka is traditionally made using small pieces of boneless chicken marinated in yoghurt and spices. This recipe uses succulent chicken breast and traditional flavours to create a delicious, authentic starter. 2. Combine all the ingredients above, minus the chicken, in a large mixing bowl until you have a smooth, orange-yellow marinade. 3. Add the chicken to the marinade and leave for a minimum of two hours—can be made the day before and left to marinate overnight. 4. Thread the marinated chicken pieces onto skewers and place onto a grill tray. 5. Grill for ten minutes, turning regularly, until cooked through and serve hot with raita and flatbreads. 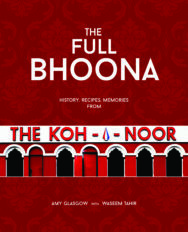 The Full Bhoona by Amy Glasgow with Waseem Tahir is out now published by Ringwood priced £17.99.